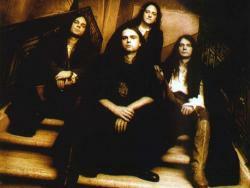 Blind Guardian is a German power metal band formed in the mid-1980s in Krefeld, West Germany. They are often credited as one of the seminal and most influential bands in the power metal and speed metalsubgenres. Ten musicians have been a part of the band's line-up in its history, which has consisted of singer Hansi K�rsch, guitarists Andr� Olbrich and Marcus Siepen, and drummer Frederik Ehmke since 2005. Blind Guardian is a part of the German heavy metal scene that emerged in the mid-1980s. They formed in 1984 as Lucifer's Heritage by K�rsch (then also bass guitarist), Olbrich, other guitarist Markus D�rk and drummer Thomas Stauch. D�rk and Stauch both left the following year, and were replaced by Christof Thei�en and Hans-Peter Frey respectively, who left as well before the end of the year. In 1987, Siepen joined and Stauch returned; under this line-up, which lasted 18 years (the longest in the band's history), the band changed their name to Blind Guardian and released their first album, Battalions of Fear, in 1988. Over the releases, Blind Guardian established themselves as a notable successful band and as pioneers of the power metal movement. In 1996, K�rsch stopped acting as the band's bass guitarist to focus on vocals. Various session members replaced him, mainly Oliver Holzwarth. However in 2005, Stauch left the band, disapproving of Blind Guardian's transition into a more complex progressive sound with a heavy use of backing vocals, and was replaced by Ehmke. Most of Blind Guardian's albums were well received by fans and critics alike: Somewhere Far Beyond (1992), Imaginations from the Other Side (1995), and Nightfall in Middle-Earth (1998), are especially seen as influential works. The music is mostly composed by K�rsch and Olbrich together, and the lyrics, written by K�rsch, are mostly inspired by the fiction of fantasy authors such as J. R. R. Tolkien, Michael Moorcock, Robert Jordan,Stephen King and George R. R. Martin as well as traditional legends and epics. Over the years a theme has developed which personifies the band members as travelling storytellers, leading fans to refer to the band affectionately as "The Bards".